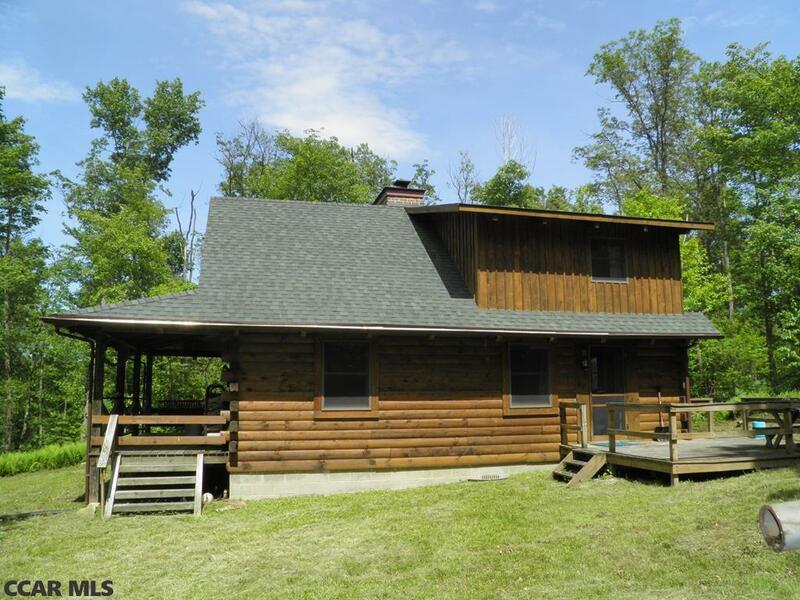 Pristine log cabin situated 30 minutes from State College. MOTIVATED SELLERS! Property consist of 2 parcels, second parcel has elevated building; primary parcel has log cabin, well with hand pump, flat to gently rolling land adjoining apx. 200 acres of community ground. ATV trails join the Bloody Skillet trail. Ride for hours! Exterior of cabin has an oversized back deck & covered porch spanning the entire front of cabin. Sit on swing and enjoy the sounds of nature. Interior of cabin has an open concept. Large kitchen flows into dining room which flows into the living room. Wood stove in Kitchen and brick floor to roof wood burning fireplace in living room. Cabin wired for electric & has gas lights. Full bath with composting toilet. Shower bladder is required to take shower. Upstairs 2 bedrooms overlooking the living room have lots of light and come furnished with a king bed in one & two bunk bed sets in the second room. You can use this cabin Year-Round! OGMs included.